On World Philosophy Day 2017, Woollahra Council launched The Woollahra School of Philosophy - delivering quarterly forums for a robust exchange of ideas between scholars, pioneering minds and the local community. This initiative is about fostering philosophical and ethical conversations at the community level, whilst covering a variety of interesting global topics. The discussions are moderated by ABC interviewer and facilitator Michaela Kalowski and the panellists will be from the Woollahra community and Sydney's leading academic institutions, including staff as well as PhD candidates. Response from the local community for this new forum series has been overwhelmingly positive with those present praising this new initiative and looking forward to future events. A philosophical discussion on The Moral Challenge of Climate Change. 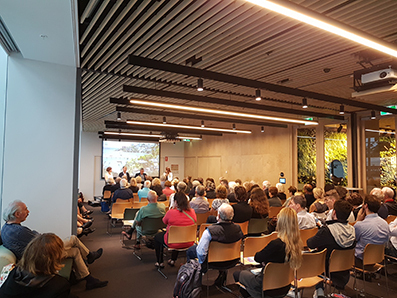 Each event will be hosted at the Woollahra Library in Double Bay during the evening, starting with a brief presentation by the panellists before opening up the discussion via questions and answers facilitated by a moderator. Sign up to get event updates delivered straight to your mailbox!